Godfrey Townsend Godfrey Townsend is an accomplished New York City musician who has worked with some of Classic Rocks biggest names over the last decade. He formed his first original band "Alexis", when he was 17 years old. They became the house band at "Coventry", a premiere rock club in Queens, New York where Billy Squiers "Piper", "New York Dolls" and "Kiss" got their start. Gene Simmons was so impressed with the band that he tried to get them signed to Casablanca Records. For nearly 20 years, Godfrey developed his musical abilities performing over 1000 gigs with numerous cover and original bands. In 1993 he finally broke onto the New York City scene and began hosting a "Pro-Jam" at NYCs China Club. For the next 2 years, he jammed with such names as Pearl Jams Eddie Vedder, Steve Lukather of Toto, Mick Jones of Foreigner, Noel Redding, Buddy Miles, Jason Bonham, Billy Squier, Bruce Willis, Will Lee, Julian Lennon, Andy Newmark, T.M. Stevens, Linda Perry from 4 Non-Blondes, Gerardo Velez and Julio Fernandez of Spyro Gyra, Pat Thrall, Peter Framptons Bob Mayo, Andy Timmons, Larry Mitchell, Ray Gomez, Joe Lynn Turner, Richie Cannata, Ace Frehley, Donny & Chip from Enuff ZNuff, Leslie West and Corky Laing of Mountain, Rick Derringer, Don Barnes of 38 Special, Steve Holly, Kasim Sulton and Moogy Klingman from Utopia to name a few. During this era, he also first met up with John Entwistle of The Who. 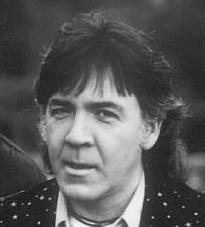 In 1995, Godfrey performed in a show called "Jukebox Giants" at The Flamingo Hilton in Laughlin, Nevada, with members of the Original Broadway Cast of "Beatlemania". He performed 2 shows a night for 3 months with such classic artists as Mitch Ryder, Spencer Davis, Joe Molland of Badfinger, Merrilee Rush ("Angel Of The Morning"), Pat Upton of Spiral Staircase, Sal Valentino of Beau Brummels, Cub Coda from Brownsville Station, Dennis Yost of The Classics IV, Len Barry of the Dovells and Tiny Tim. Godfrey has also worked with British pop artist and songwriter Martin Briley ("Salt In My Tears") and classic songstress and singer Jackie DeShannon ("Put A Little Love In Your Heart", "What The World Needs Now"). As front man (guitar and vocals) since 1996 for The Whos John Entwistle, he has toured the US and Canada several times and recorded a studio and live album with The John Entwistle Band. Godfrey has also attended and performed at several NAMM conventions in Anaheim and Los Angeles with John Entwistle. As an endorser for Paul Reed Smith Guitars, Gibson Guitars, Eventide Harmonizers, Tech 21/Sansamp, Concept One Percussion and Cakewalk Digital Recording Music Software. He performed at NAMM with Jon Anderson of Yes, Rod Morgenstein, Jeff "Skunk" Baxter (Doobie Bros. & Steely Dan), Jack Casady of Jefferson Airplane & Hot Tuna and Texas blues guitarist Chris Duarte. For the past 3 years, Godfrey has been musical director for 21st Century Artists "A Walk Down Abbey Road"; hes toured the US, Canada and Japan extensively with such superstars as Alan Parsons, Todd Rundgren, Ann Wilson of "Heart," Mark Farner of "Grand Funk Railroad," Christopher Cross, Jack Bruce of "Cream," Denny Laine from "Wings," Joey Molland from "Badfinger," David Pack of "Ambrosia," and Eric Carmen of "The Rasberries." Godfreys vast musical knowledge and repertoire in the "Classic Rock" genre, as well as his talents as a guitarist, vocalist and keyboardist have kept him in demand. He is currently a member of The Alan Parsons "Live" Project and has also recently toured with Jack Bruce of "Cream" and Dave Mason of "Traffic." He has assembled a talented and versatile group of musicians who he uses when performing around town as well as for touring with "A Walk Down Abbey Road" and "The Alan Parsons "Live" Project." Godfrey Townsend has astonished audiences for 2 consecutive years at NYCs B.B. Kings Blues Club in Times Square with "Clapton is God-frey," a "definitive" tribute to guitar great "Eric Clapton." He has also appeared at B.B. Kings performing a concert series, entitled, "Classic Rock Guitar Greats." This series included several shows, such as "Masters of the Stratocaster," a tribute to Jimi Hendrix, Stevie Ray Vaughan, Jeff Beck, Dave Gilmour, Robin Trower and Eric Clapton and "Yardbirds Who Flew The Coop," a tribute to Jimmy Page, Jeff Beck and Eric Clapton. This page, copyright 2004 The Avenue / Avenue Communications.